Progress on the allotment....and a little help again please!! OK...so I figured it was time I gave you an update on how the plot is progressing but rather than ramble on for hours I thought I would give you a pictorial view with few words...after all, everyone loves pictures!!! My first picture here shows the earth just dug over, I took this so you could see how moist it is under the ground even though people are continually moaning about the lack of rain and keep wasting water on there plots! 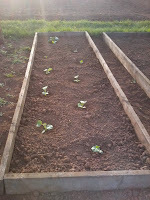 The second picture shows my first planted raised beds which has nine gherkin plants and pumpkin at the end. 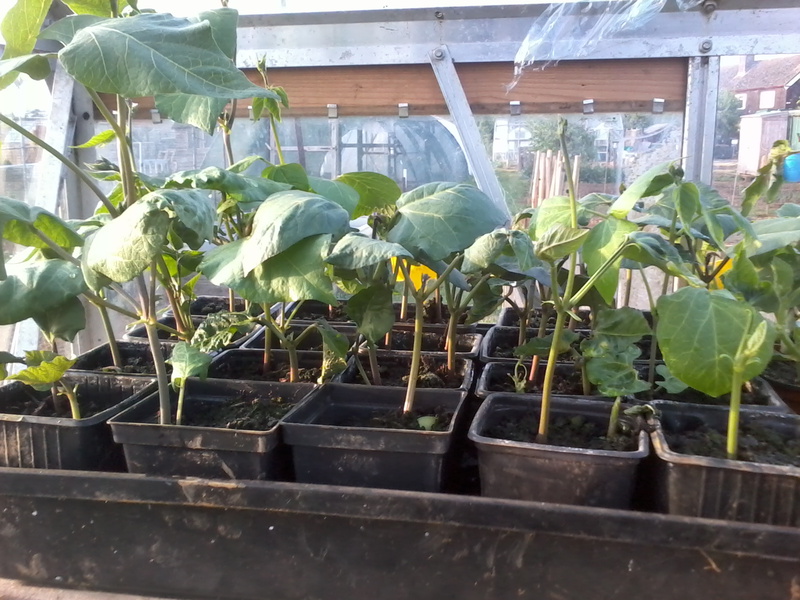 Above you can see aubergine, runner beans and melons. 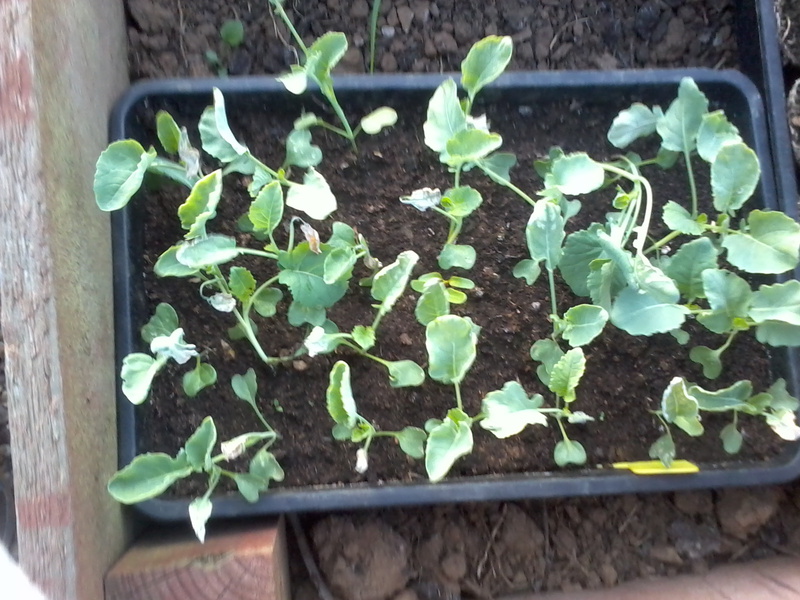 The runner beans are on their second sowing as I had a whole packet of seeds that didn't germinate first of all. 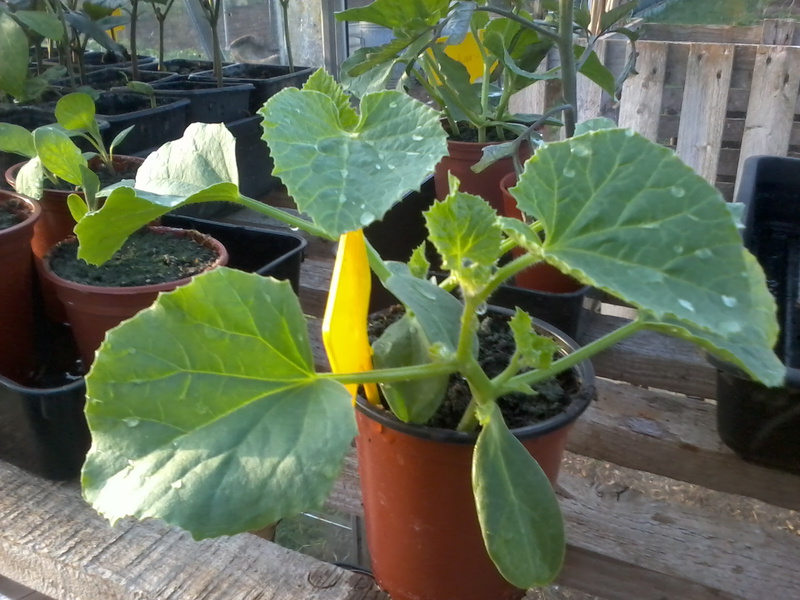 The melons and aubergines will be planted into the ground in the greenhouse by the weekend hopefully. 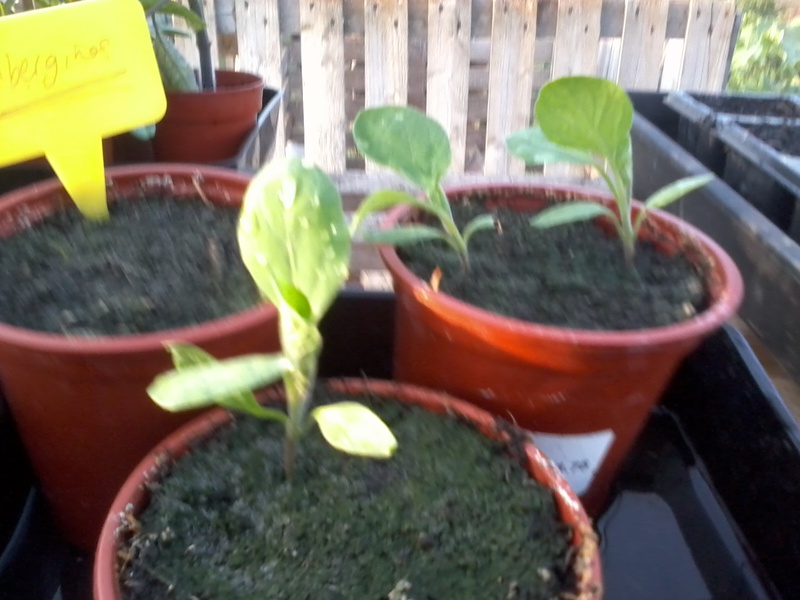 Various pepper plants, parsnips and calabrese. I am VERY impressed with my parsnips and will hopefully get them into the ground in the next week or so, the same with the calabrese as it's starting to get a little leggy. 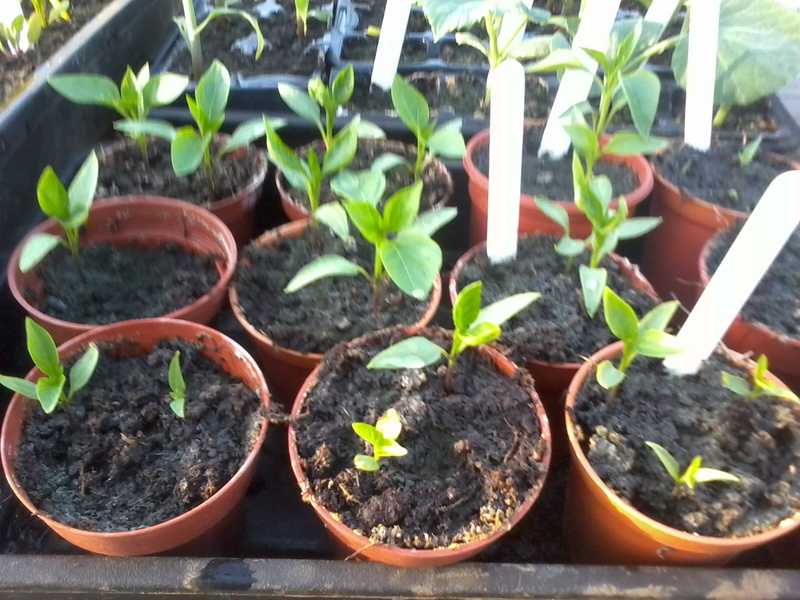 All the peppers will stay in the greenhouse but are a little too small to be potted on yet. Rhe cabbages are getting leggy and will be put into the ground this week, the sweetcorn did really well and I have already put this in the ground...I just now pray we don't get any frosts before it has established itself, either way it wasn't going to last much longer in it's pots as it had got so big. There is plenty of blossom on the blueberry bushes which is very exciting!! 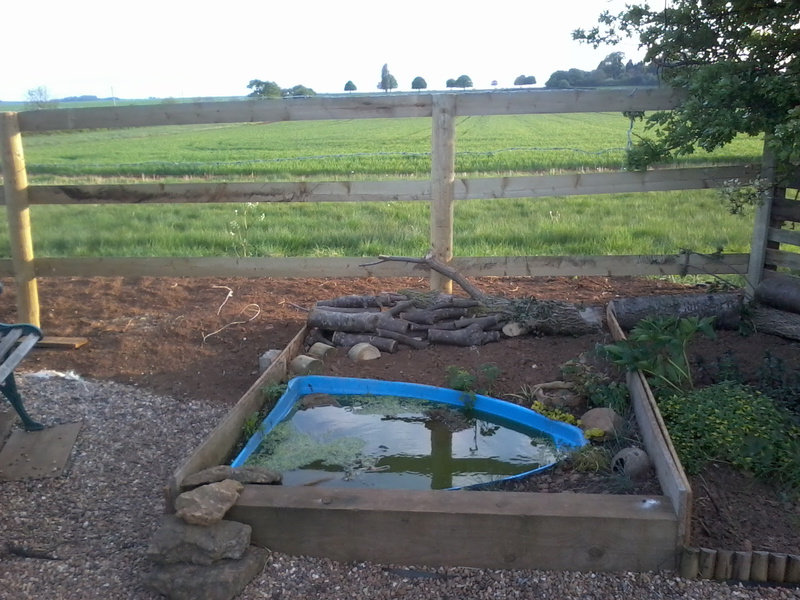 Above you can see the new fence and almost finished pond area plus the new manure fence and extended herb patch. The back fence is going to have blackberry brambles planted all the way along for myself and my plot neighbour to share which we will hopefully get sorted this weekend and then I will carry the gravel on right up to the fence and put a border along the bottom so it all flows in together. 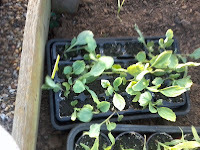 So that's what I have been up to, I also got my broad beans lines plugged up with the extras I put in the greenhouse and an extra row put in front of the black eyed peas. My germination rate has been excellent this year which has made me very happy and all my tubs on the gravel are doing well, I even see celery germinating!! 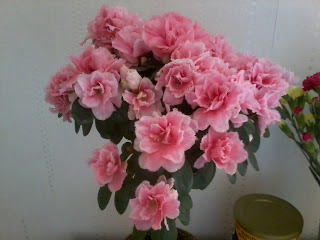 And this is where I need the help...does anyone have any idea what the above plant is? My sister bought it for my Mum but there was no label on it...it has a long stem so resembles a tree more than anything but we would really like to know what it is and whether it's suitable to be planted outside so I'm hoping someone knows!! Hope your gardens are all growing well. The unseasonably warm weather is continuing and we have still only had a light sprinkling of rain.....though a few miles away did get flash flooding at the weekend. Rain is forecast for this evening but I won't hold my breath on that one!! 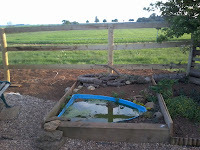 Still, the earth is nice and damp underneath and we are certainly no where near having to even think about watering yet!! P.S. Just click on any of the pictures to enlarge them for a better look!! 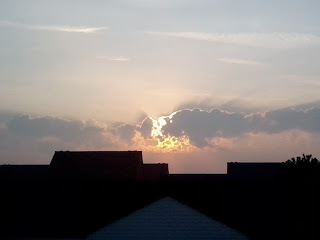 Weather Watch Wednesday...week 16....20/04/2011 and Thank You to 'The Good Life'!! Well the weather has been pretty much the same for the last week, we had a couple of 'cooler' days but this was only by a few degrees and then the last few days the temperatures have got increasingly warm...today we were at 21 degrees which is amazingly warm for April. Still no sign of rain and the winds have been light at just a few miles an hour. Ground still very moist underneath so i am only watering the pots on the allotment and in the greenhouse though the water butts are getting dangerously low and I think I will have to get some tap water in them soon which is a shame!! Still, I'm not grumbling about the weather....I'm loving every minute of it!! So now to my thank you. A while ago I entered a give away and won. I was very Happy to win and it was from a blog that many of you may know of but if you don't then you should definitely go and check it out and I really enjoy reading Jo's 'The Good Life' and think you will too!! Not only did I receive the garden diary as promised but lots of other goodies too including, chocolate...Yum...that didn't last too long! 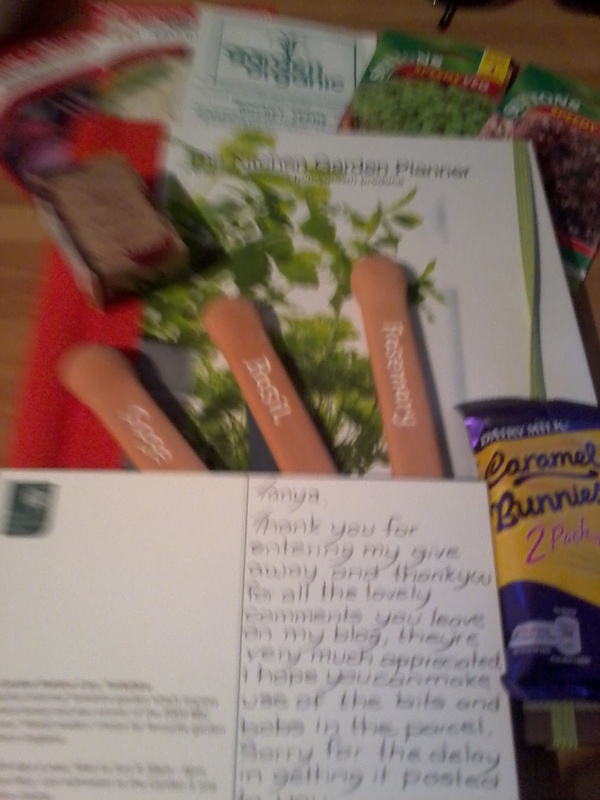 !, some seeds, some plant markers and some soap....Thanks so much Jo, I loved everything in the parcel and the diary is great!! 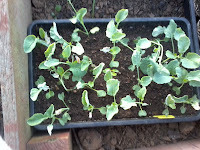 I have been and got some work done on the allotment too, I manged to get my peas, mangetout and black-eyed peas in the ground and I have also sown some beans that I don't know the name of so maybe you can help with identification when they start to grow and some french dwarf beans. i have also started to harden off some of the plants in the greenhouse ready for transplanting outside...hope the weather is being as good for you too!! Been very busy with the glorious weather but promise to catch up with all the blogs I follow and reply to comments by the weekend!! Hard work at the allotment!! Well I went down the allotment yesterday afternoon to work on breaking down some of the mud clods before they got to dry and to do this I used the tiller....took a while but I enjoyed my time and whilst I was there one of my allotment neighbours asked if they would perhaps be able to borrow my tiller next week to do theirs....I said this wouldn't be a problem. 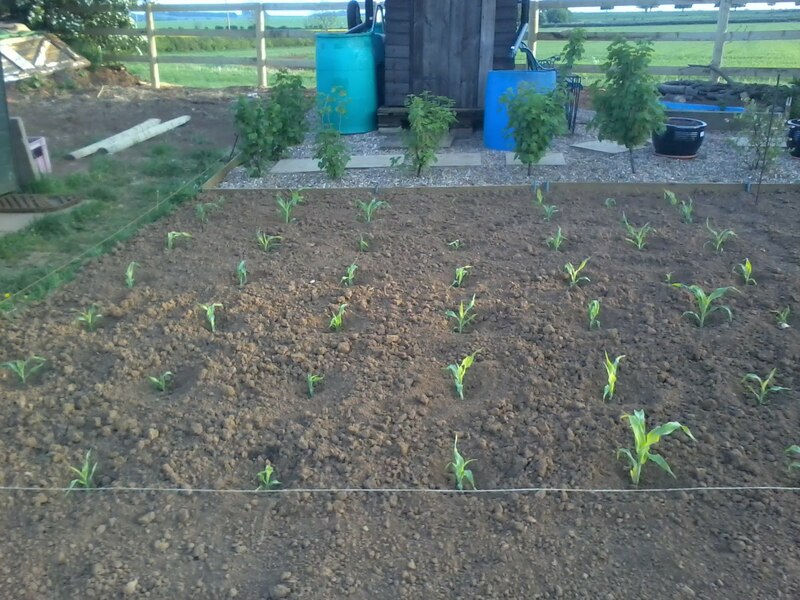 I managed to get it all finished by 8pm and decided to call it a day and popped back down the allotment early this morning to get some carrot seed in. Whilst there I decided that I would go over Sophie's plot for her and got that one too. Then I was approached by Dave who is doing the fencing around the allotment talking about the 'mound' at the top end of my plot and how it really had to go and be leveled off for the fencing to be done...I was worried about winds across the fields but he said this could be combated if I put some panels across the bottom of the fence so started the mammoth task of sorting what I wanted and clearing the debris....and boy was there a lot of debris!! Now if you can't remember what it looked like before you can check back through previous posts...(I was going to put a link here but can't work out how to do it..sorry)... Or if you really need me to I'm sure I can put another picture in for you...but anyway below are the pictures of how it looks now. The fence will be going in tomorrow and then i will be deciding what to do with the extra space I have gained. 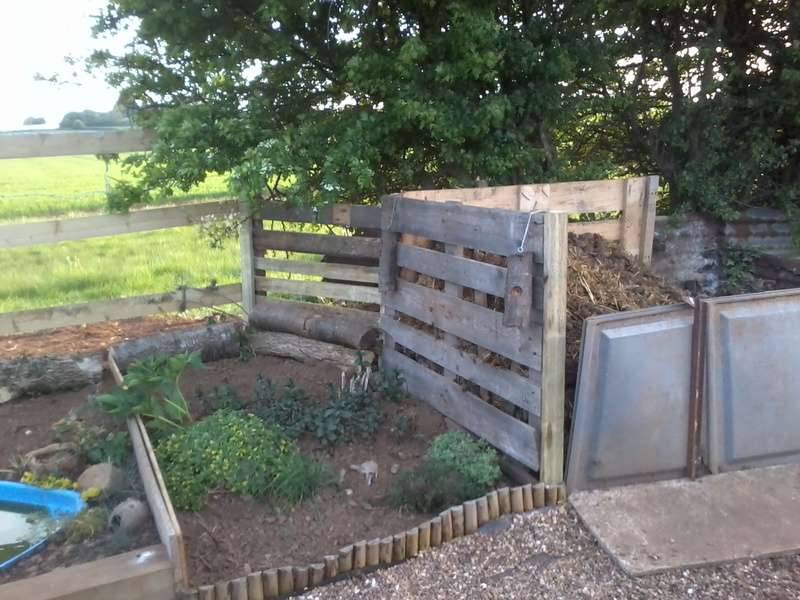 I know I am going to extend the pond planting area and the herb patch but I haven't totally decided what to do with the extra space behind the shed yet. I do think it is already looking much neater. So what do you think?? Much neater and nicer?? I will take more photos when it is all completed. It has been a glorious day today so it wasn't too bad doing such a hard job...however my right ear is seriously paying for it as this was the side to the sun and it's now terribly blistered...note to self...put sun cream on ears!! The little mishap of last Friday..and freezing leeks!! OK...so several of you wanted to know exactly what my little mishap down the allotment was last Friday. The thing is I guess I could not have mentioned it at all and no-one would ever have known, it would have been my little secret...but in hindsight it was kind of funny (apparently if you were watching me it was bloody hilarious but that's another story!) and who can you laugh about it with if you keep it all to yourself, so of course I have already told my Parent and Hubby who got a jolly good laugh out of it too. Hhhhmmmm...I think I may be stalling a little so I will just get on and tell it now...here goes!! So I am don the allotment and I want to put in some onion sets. This I thought was going to be quite an easy task, the earth had been previously dug so I thought I can just run over it with the tiller and plonk them in...be done in no time at all. I got the tiller out, fired it up, and went on my merry way whilst jollily listening to my mp3...totally minding my own business and without a care in the world. After I had tilled enough earth for the white onions I let go of the throttle...and...nothing...that's right, the tines kept turning and didn't even slow a slightest fraction. Now I knew that this wasn't right but it was easily solved by cutting the power and the main switch and the tiller was put to one side whilst I put in the white onions...first job completed successfully.....can you guess what happens next????? Well as you can probably imagine I was a little apprehensive about re-starting the tiller after the throttle didn't cut out so I had a very firm grip on it and placed it on the soil where it could do no damage if the times started turning straight away and I gave the cord a good tug...and....a soft little purr came from the engine and there it stood proudly with the engine ticking over nicely and the tines not moving. This put me totally at ease and then as I was just about to get started my phone which was down near the greenhouse went off so I put the foot-stand down...left the engine ticking over and went to see who the message was from (just in case your interested it was Kate saying she wouldn't make it down that day). Anyway as I was looking at my phone I heard a noise...I turned round to see that the tines had started of there own violition which had kicked up the stand and the tiller was merrily whizzing it's way acros the allotments right through somebodies potato patch and towards some wire they had set up to protect their newly planted crops. I though a lot of choice words and took off full pelt after the tiller managing to snag hold of it and cut the power just before it wrapped itself around the wire. I looked around and didn't think anyone had seen so I quickly re-erected the potato mounds and then re-started the tiller and kept a firm grip on it not leaving it alone for a second and cutting the power every time I wasn't actually using it. I caught sight of Dave and beckoned him over to have a quick look at it, only to find out at that point that he had seen the whole episode and thoroughly enjoyed that mornings entertainment...so much for nobody seeing!! So there you have it...that was my little mishap! The tiller is now fixed and the throttle working fine......It's just as well I see the funny side of things...hope you all enjoyed it too!! On top of that...on Saturday whilst watering the greenhouse I managed to drop my tray of calabrese seedlings upside down on the floor..so the quick trip to water turned out to be a lot longer as I then had to sift through compost to find un-broken stems to re-plant...but at least the pricking out got done and the transplanted seedling are looking very healthy! Oh..and as for freezing leeks...it tells you in most books that they aren't really suitable to be frozen but I like to have a few in the freezer...I simply cut them into inch pieces...give them a wash, dry then and freeze them. I only use these ones for adding to casseroles and stews but they taste just fine and it means that I have them ready prepared to chuck in the pot quick...they are especially great for when you need to make up a quick vegetable stock!! In the event that I am absolutely crackered this will be real quick!! Weather started off nice but has now cooled down. We've had some windy days but no frosts. It keeps trying to rain but we haven't had enough to even fill a teacup. Hopefully the sun and warmth will return soon!! 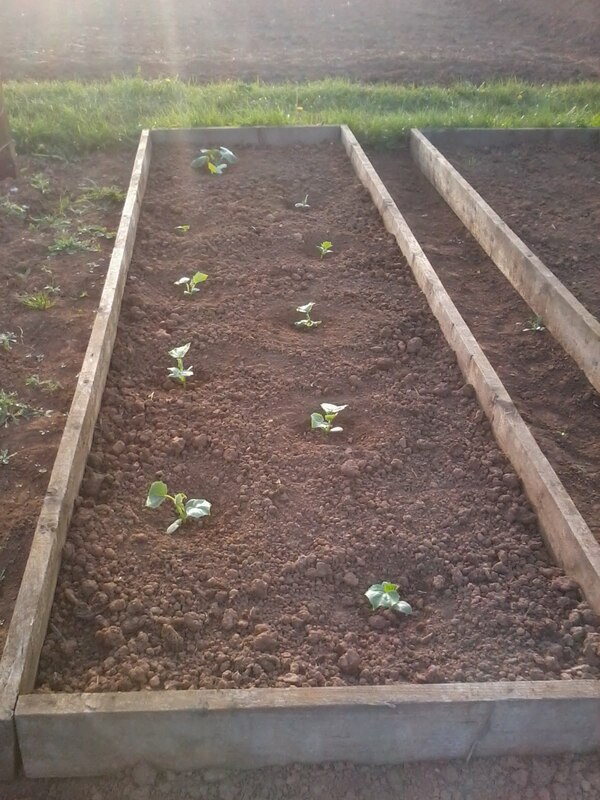 I did pop down the allotment Sunday evening and put in some turnip and swede seed. This is a first for me and I have been told by other plotters that they don't do so well so we shall see!! I did remember to take my camera down though so here's some pics...even if they aren't very exciting!! How the bottom end plot is looking! The rhubarb is coming along nicely!! The herb patch fared the extreme winter quite well! 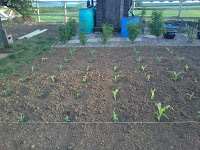 The top end of the plot, dug and ready for planting. Plenty of redcurrants to be had this year!! 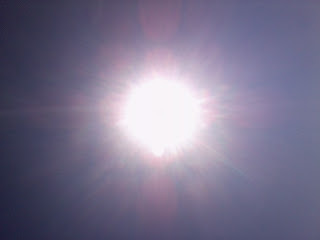 Sunny warmth brings busy days!! Well it has been a glorious weekend here and so I have spent plenty of time busy down the allotment. As is par for the course with me not once did I remember to take the camera down so I will just be telling you a little about what I did and then post some pictures later. 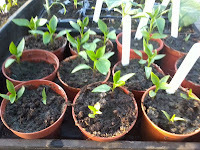 I got plenty of salad seeds sown in the containers around the greenhouse and now have pak choi, celery, carrot, beetroot, lettuce, rocket, basil, radish, spring onions and probably more but I haven't written a list yet so if I have missed any I will let you know. I managed to buy some more onion sets and got those sown in the ground over the weekend too, one row of white and one row of red. Winter greens were dug up and prepared for dinner and that bit of earth dug over. Kale was dug up and eaten, W.S.B. was dug and discarded as were some of the beyond help winter greens which got attacked by the birds though there are a few of these left for us to dig and eat. I also dug up most of the leeks that were left to make soup and the few that are left in the ground I am going to dig up over the next couple of days and prepare and freeze them so that the ground is left free for planting. 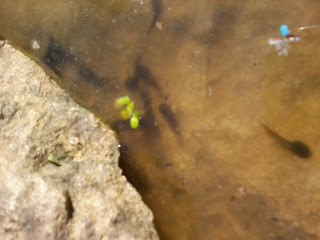 I did manage to get a rather blurry photo of the tadpoles though...they are all doing incredibly well in the pond!! The tadpoles were very lively in the sun-warmed pond!! I also scrubbed my garden slabs and mowed the lawns...so a very busy weekend really. There was a funny incident with the tiller and the calabrese but maybe I won't tell you about that....or maybe I will leave it for another post if you really want to know...Do you want to know?? So I'm a day late again with the weather watch but it was all go, go, go yesterday with projects and meetings and stuff so I hope you all forgive me!! The week started off cool, cloudy, a little rain and some seriously strong winds but it took a turn for the better yesterday with warm temperatures, we even got to take off our coats!! The warm weather is said to stay for the weekend so here's hoping I can get lots of work done down the allotment!! 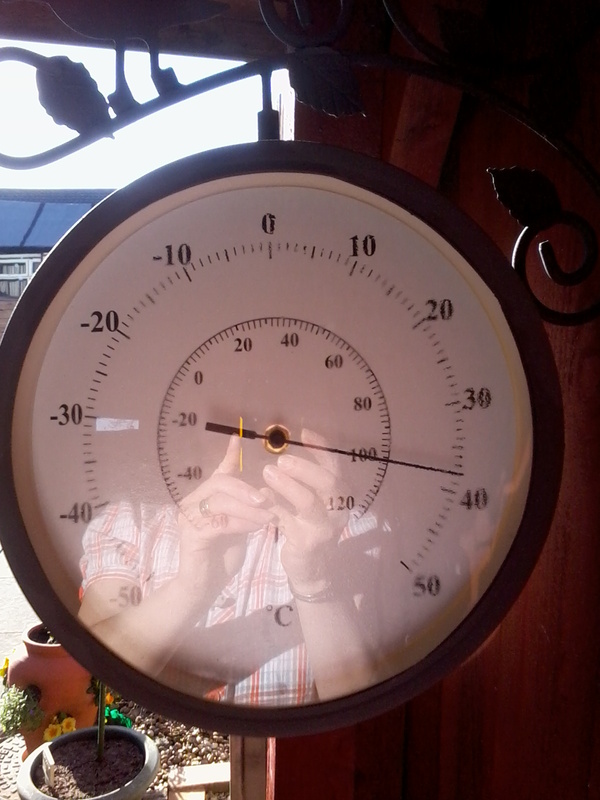 The temperature just outside my back door where there is a little sun trap!! 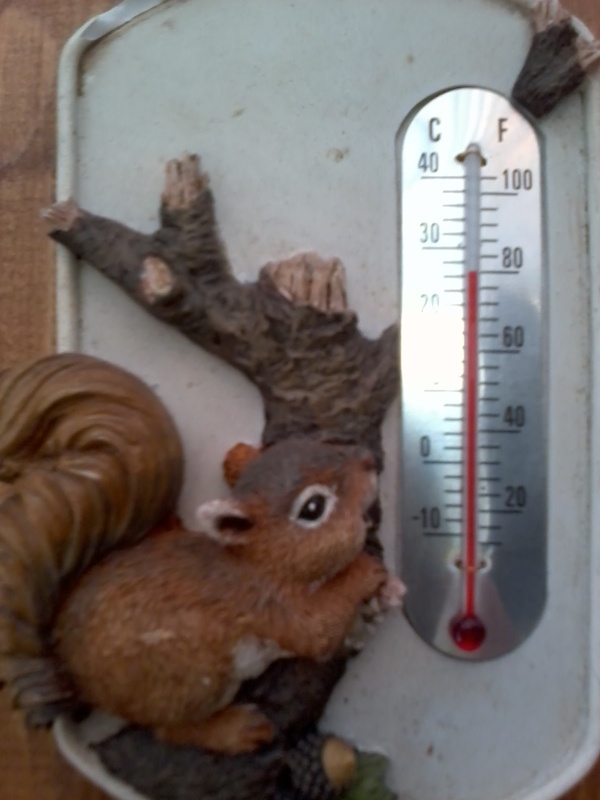 Indoors temperature...no heating on at all!! Bliss!!! Hope you're all enjoying a spell of warmth too! Potatoes...how do you plant yours?? 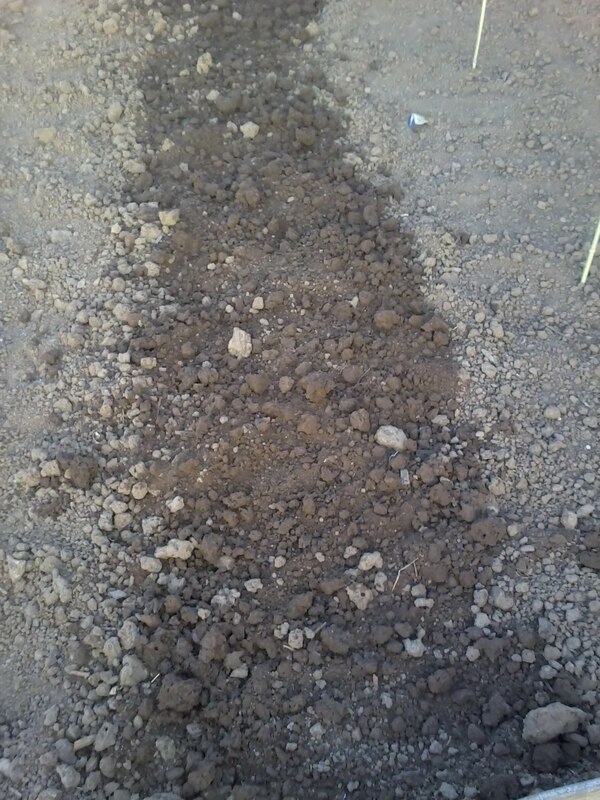 Well I went down the allotment today to get some potatoes and the onions in the ground. The onions never actually got into the ground though as when I went to get them out of the shed I founds that there was nothing there...just empty packets. A close inspection of some faeces showed that it was probably the cause of mice in my shed. They hadn't touched the potatoes at all but chomped there way through all of my onions. I got some fresh white onions form the allotment shop but they have no red so I will have to buy some more of those and put them in the ground when I get some time during the week!! This is what was left of my onions!!! Anyway whilst I was digging out to plant my potatoes it got me to thinking of the way other people might go about planting there potatoes so I thought I would ask. The beauty of gardening and growing your own is there is never a right or a wrong way to go about things. 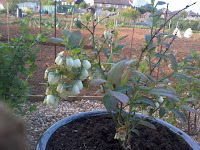 As long as it is planted then essentially it will grow and there are different ways to plant your potatoes. 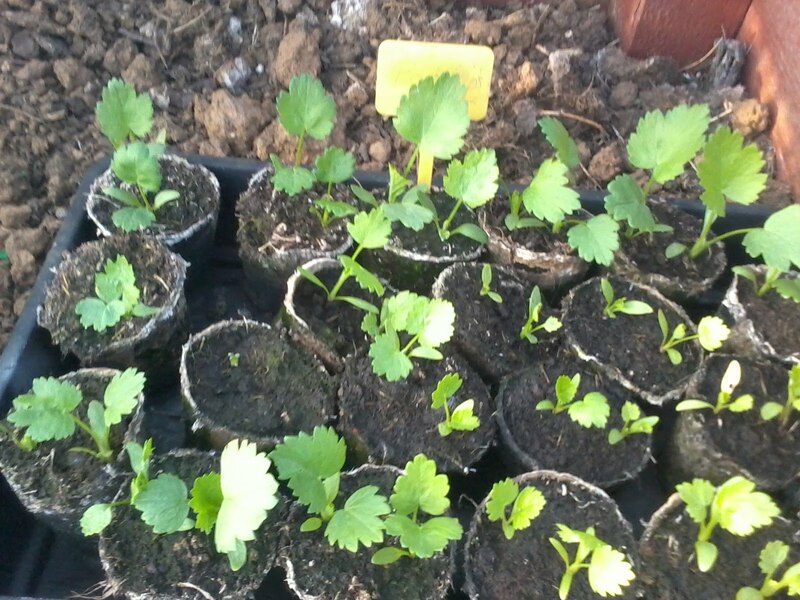 If you have a small garden or yard then you can grow them in bags or planters. You can dig a trench out and fill with fertilizer...you can hill them up....you can dig them down...you can use manure or compost or just soil. None of these ways are wrong and everyone has their own preference. So I am going to share with you my way of planting potatoes and hope that you will share yours with myself and my other readers too. I remembered the camera today so I will share in pictures to make the post a little less boring!! First thing to share with you is that I'm not one to avidly 'chit' my potatoes. I buy them and then just leave them in the bags in my shed until I'm ready to plant them. They always start to chit and then they just go in the ground. 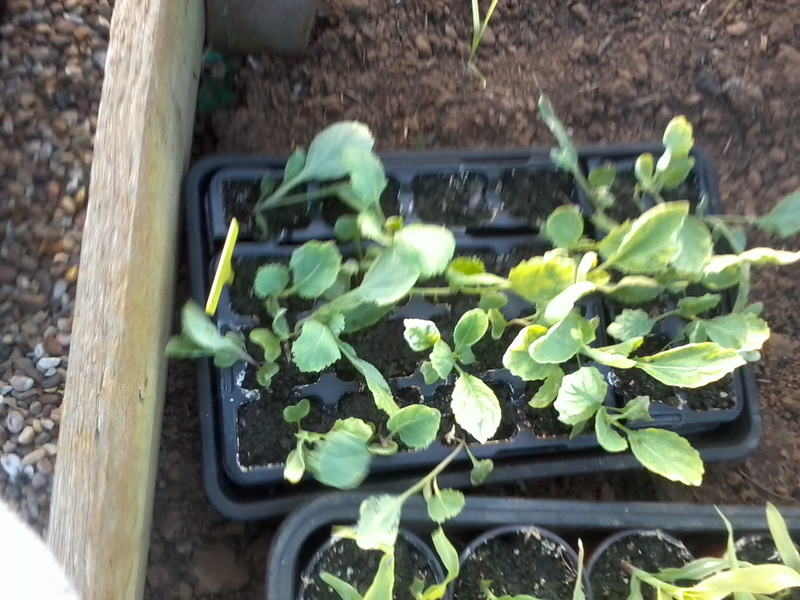 I don't count the shoots coming off and I don't take any off as I invariably knock one or two off anyway during the planting process. First I put a line down and then dig out a trench for the potatoes. 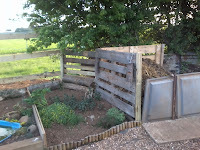 Then I spread some manure along the length of the trench, not too much though, for four rows I used just under a barrow full. 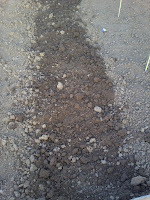 Then I place the potatoes in the trench, mark each end with a stick and then rake the hilled earth over the top. And that's it, job done. Of course I dig the soil well first too but this was done last weekend when digging out the twitch so didn't have to be repeated today and made the job a lot easier. A line doesn't have to be put down but I do this so that I know what I am working to and the lines stay relatively straight and far enough apart, it just means I don't waste ground by veering off. I will hill up my potatoes as they grow, I didn't do this last year and not doing it is fine but last year was the first time I grew main crop potatoes and it was difficult to know where to dig after the tops had died off so I will hill them up more for a guide for digging than anything else although hilling them up does also stop any poking through the top of the soil and going green. So there you have my method of potato planting, does it differ greatly from yours?? I guess I should have took a picture of the finished planting area but to be honest it's just a patch of brown mud anyway!! I also weeded around the grapevines today which are just starting to show a little life, weeded the asparagus bed which still looks dead and also took the weeds out of the cold-frame. It was a bust morning but also very satisfying! !